Taxonomy: Purple and Orange Lobster belongs to the Kingdom Animalia, Phylum Arthropoda, Class Crustacea, Order Decapoda, Family Nephropidae, Genus Enoplomentopus and Species debelius. Scientific names: The scientific name of Purple and Orange Lobster is Enoplomentopus debelius. Other common names: Purple and Orange Lobster is also commonly known as the Red Lobster and Debelius' Reef Lobster. Origin or natural range: Enoplomentopus debelius is found in the tropical areas of the Indo-Pacific region. Size: Purple and Orange Lobster may grow up to a size of five inches. Color: Enoplomentopus debelius occurs in purple, orange and yellow colors. 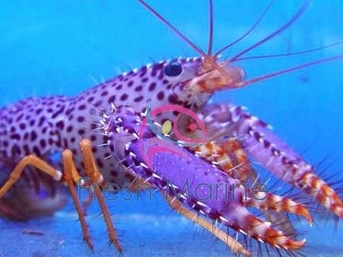 Compatibility: Purple and Orange Lobster is aggressive towards the other marine animals. Enoplomentopus debelius is found on coral reef in its natural habitat. Purple and Orange Lobster is nocturnal in its habit and feeds at night. The body of Purple and Orange Lobster is purple or white in color with orange and purple spots on it. The claws of Enoplomentopus debelius are flat and elongated with purple shade. Purple and Orange Lobster uses its claws for its defense as well as for feeding. Temperature of water: The temperature in your marine aquarium must be maintained within seventy-two to seventy-eight degrees Fahrenheit. Specific gravity of water: 1.023 to 1.025.
pH of water: 8.10 to 8.40. Illumination: Purple and Orange Lobster requires light in the marine aquarium it inhabits. To host Enoplomentopus debelius, you should have a reef type marine aquarium having a thick layer of gravel or sand at the bottom of it, so that Purple and Orange Lobster may bury itself into it. Place some rocks and rock caves for the lobster to hide and some Live Rock for Enoplomentopus debelius to hunt for food on. Place only one Purple and Orange Lobster or a mating pair of it, in a marine aquarium. After molting, Enoplomentopus debelius hides behind rocks or in rock caves to allow its new exoskeleton to form completely and harden. Owing to its nocturnal habit, Purple and Orange Lobster will hide behind the rocks or in rock caves during the day time, away from light. Enoplomentopus debelius is omnivorous in feeding habit and eats the meaty bits of seafood and small sized and medium sized fish. Purple and Orange Lobster looks for food into the sand and ploughs it well in the process. Enoplomentopus debelius ploughs the sand well in order to look for food thereby aerating it well. Purple and Orange Lobster feeds upon detritus and thus, cleans your aquarium off it. Purple and Orange Lobster is easy to maintain owing to its non-poisonous nature. The high levels of Copper and Nitrates may be detrimental to the health of Enoplometopus debelius. Add Iodine and Calcium to the water as dietary supplement for Purple and Orange Lobster which will help smoothen up its molting process. Enoplometopus debelius may harm small fish and marine invertebrates in your reef tank therefore, do not keep small fish and marine invertebrates in the same aquarium. Purple and Orange Lobster is aggressive towards the other member of its species therefore, only one Enoplometopus debelius or a mating pair of it should be kept in a marine aquarium.